Factory Sealed 2014/15 Leaf ITG Heroes & Prospects Hockey Hobby Box mit 1 Pack a 9 Cards per Pack. 5 Autogramme und 5 Memorabilia Cards per Box !!! Produktinformationen "2014/15 In The Game Heroes & Prospects Hockey Hobby Box"
Leaf is pleased to announce the return of one of In the Game's staple CHL licensed releases, 2014-15 In the Game Heroes and Prospects Hockey. This release celebrates the most elite young players in the CHL, while also remembering some of the game's most popular and notable players of the past. Draft Prospect Autographs featuring highly touted 2015 draft picks hand numbered to 15! Between the Pipes Memorabilia cards featuring a selection of Goalie Gloves, Goalie Pads or other game worn material of some of the game's most recognized net minders. 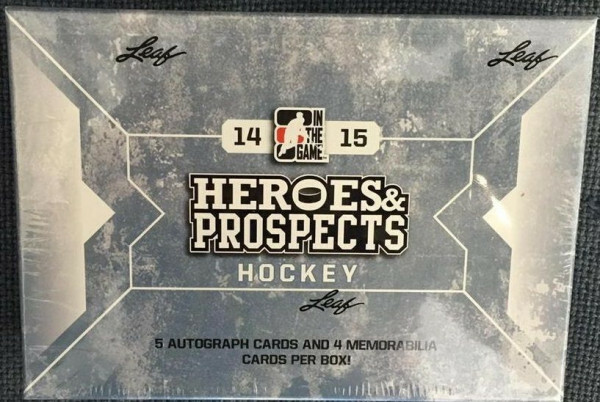 Weiterführende Links zu "2014/15 In The Game Heroes & Prospects Hockey Hobby Box"
Fanbewertungen für "2014/15 In The Game Heroes & Prospects Hockey Hobby Box"